Once in awhile we need that one game that can allow us to let loose and just enjoy the immaturity in life. In other words, a chillax game. Gobtron by Juicy Beast Studios would be one of those chillax games I am talking about. There are many defense games out there, so much that it’s really hard to find any good one these days. 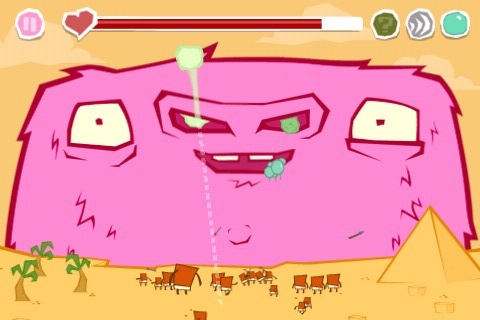 What makes Gobtron stand out compared to the rest is the concept of a giant monster shooting snot. Yes I didn’t bite my tongue on that. Your main weapon is an elastic snot hanging from the giant beast’s nose. From villagers to armies, people come and try to take out this giant beast. There are many types of units which you will have to decide a priority on. Upgrades are also available, from stronger snot to snot shields. Even health upgrades will allow you to progress through the game easier. By completing each mission you will collect a currency which allows you to purchase these upgrades. The gameplay is very simple and smooth. Like a rubber band, you stretch the snot in an opposite direction to a get it to fling and hit the enemies. However, just randomly swiping your screen will get you nowhere. Trust me, I’ve tried. The game has a good flow and handles many enemies onscreen at once. The game art isn’t anything special, but it gets the job done. GOBTRON stands out for being very original and the animation is fluent as well. One of the problems I had with this app was the lack of game types. There is only one which is the main goal of the game. Each mission feels the same if it wasn’t for the change in layout, from villages to armies, to pyramids I definitely would have gotten tired of this by the third stage. However, for the asking price of $1.99 there isn’t much more for me to complain about. Plain and simple, GOBTRON is fun. Not too complicated, and not too hard. Definitely something you can pick up and learn right away. I would recommend this game to someone looking for a quick and simple iPhone game. 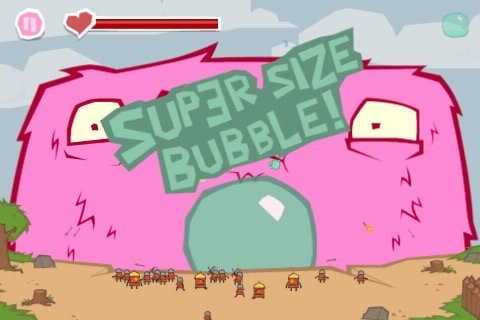 AppSafari review of GOBTRON was written by Vincent Tam on June 13th, 2011 and categorized under Action, App Store, Arcade, Games. Page viewed 4745 times, 1 so far today. Need help on using these apps? Please read the Help Page.